Executives at Anadarko and Noble Energy are the board members and the Western Energy Alliance’s communications manager is the spokesperson for a new natural gas group in Colorado. The Center for Western Priorities takes a look at this group and asks the obvious question – is it willing to break ranks with the oil and gas industry, or is it just another empty mouthpiece. A new industry-backed oil and gas group has sprung up in Colorado, and it’s calling itself CRED (Coloradoans for Responsible Energy Development). According to profiles in the Denver Business Journal and Greenwire, the group was created by top executives at two of Colorado’s biggest oil and gas players. CRED says its purpose is to correct Coloradans’ misunderstandings about the oil and gas industry. But, clever acronyms aside, the group is going to have to prove its CRED-ibility as an impartial, legitimate information source, before anyone’s going to take it seriously. That means acknowledging facts and taking positions even if they conflict with industry talking points. Read the full post and judge this new group for yourself. News stories last week show that BLM Colorado State Director Helen Hankins is up to her old tricks. According to stories in E&E News’ Energywire, the Durango Herald, and the Denver Business Journal, Dir. Hankins is following her consistent pattern of offering to auction off controversial land for oil and gas, even after major public outcry. This time, Dir. Hankins’ plans to offer more than 10,000 acres near Mesa Verde National Park – worsening air pollution problems the park is already experiencing from existing nearby drilling operations and coal-fired power plants. It’s worth noting that bringing these oil and gas proposals back puts Dir. Hankins in direct conflict with the balanced approach to public land use that Interior Sec. Sally Jewell spent her weekend endorsing to Western governors. You may remember that in early 2013, Dir. Hankins deferred the Mesa Verde parcels after the National Park Service, landowners, and community groups protested the threat posed to the park from drilling pollution. Her reversal demonstrates why Sec. Jewell should rein in the Colorado BLM office and ensure that Dir. Hankins is using innovative 2010 oil and gas leasing reforms such as “Master Leasing Plans” which allow a more balanced approach to energy development and look at on-the-ground impacts, including threats to air quality and tourism and recreation. Instead, Dir. Hankins continues ignore the balanced approach Westerners want and plays her part as the oil and gas industry’s real estate agent. In the Durango Herald, Emery Cowan reported that the La Plata County Commissioners sent a letter to Dir. Hankins asking her to implement the Obama administration’s oil and gas leasing reforms. “However, by making the decision to lease (the La Plata County parcels in November), the BLM appears to be shutting the door on a (master plan) and a smart approach to protect the treasures that are so important to our local community and economy,” the letter said. 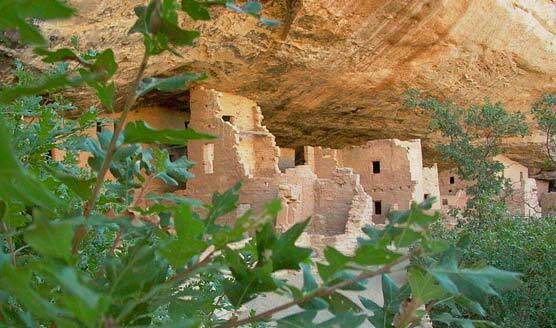 Scott Streater, writing for E&E News, noted that former park rangers weighed in on the original lease sale with concerns of how oil and gas leasing would affect one of the nation’s most iconic parks, Mesa Verde National Park. Writing in the Denver Business Journal, Cathy Proctor noted that Mesa Verde attracts more than half a million visitors annually. The federal Bureau of Land Management is moving forward with a controversial plan to offer about 12,000 acres of mineral rights in southwest Colorado for oil and gas drilling at its November auction — including parcels near the entrance to Mesa Verde National Park. As public outcry continues to grow, we’ll be watching to see if Dir. Hankins is allowed to continue making the Administration’s reforms into a broken promise for Western communities. It should come as no surprise that in the 2013 legislative session alone, the oil and gas industry spent $1.06 million defending Gov. Hickenlooper’s pro-Big Oil agenda. Gov. Hickenlooper has had a team of oil and gas lobbyists supporting his administration’s work to gut or kill legislation at the state capitol. 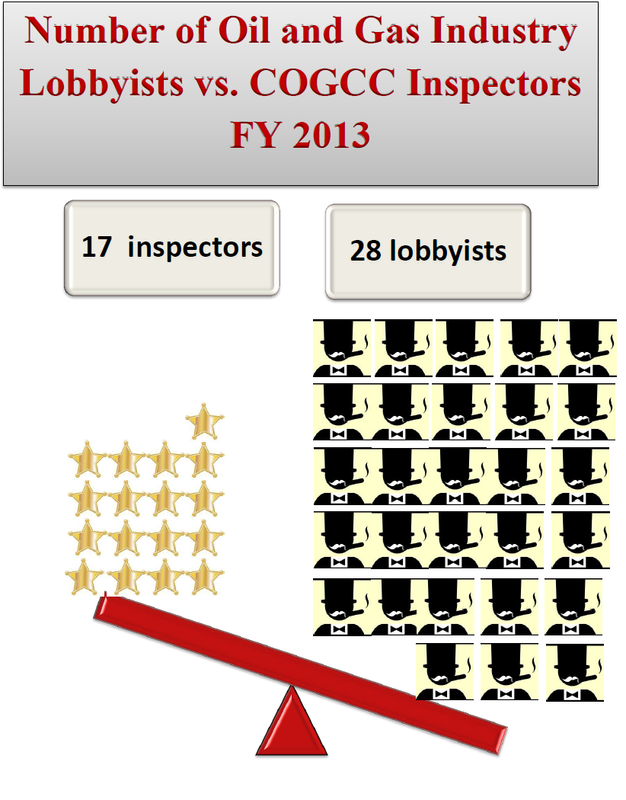 In fact, a Colorado Ethics Watch report released this week found that oil and gas lobbyists outnumbered oil and gas inspectors by a 28-to-17 margin during Fiscal Year 2012-2013. That investment has paid off big for Gov. Hickenlooper and the oil and gas industry during the 2013 legislative session. Gov. Hickenlooper gutted a bill that would have set mandatory minimum fines for oil and gas companies that pollute rivers and water. After the bill died, his administration announced it would not fine Williams Company for polluting Parachute Creek, a tributary of the Colorado River, with cancer-causing benzene so long as it adhered to a consent order. His administration actually opposed an effort to add more oil and gas inspectors out in the field and opposed a bill which would have brought more balance to the commission that oversees oil and gas drilling and fracking operations in the state. With huge sums of lobbying cash, not to mention state Los Angeles Bails Bond firm lobbyists behind him, it is no wonder that Gov. Hickenlooper has been able to keep Colorado weak on polluter crime when it comes to oil and gas. The report released this week by Colorado Ethics Watch found that the oil and gas industry has spent a whopping $4.7 million on lobbyists from Fiscal Years 2008-09 through 2011-12 – more than any other industry in Colorado except the health care industry. For those tracking Chesapeake closely, the company spent $130k on lobbying efforts over the last four years. Other top oil and gas lobbying spenders since 2009 include Pioneer Natural Resources at $640k, Shell at $571k, Encana at $415k, Bill Barrett Corporation at $376k, Marathon at $293k, Williams Energy at $285k, ExxonMobil at $272k, Anadarko at $260k, Black Hills at $224k, and, of course, the Colorado Oil and Gas Association at $402k. The cozy relationship between politicians and big business has been a fact of life in America since the days of the robber barons. Today, this affiliation is especially strong between certain governors and the oil and gas industry. And, the consequences could include drastic impacts on the health and safety of their constituents. Nowhere is this more apparent than in the case of Colorado’s Gov. John Hickenlooper. It turns out that this wasn’t the last time that the governor would go to bat for the oil-and-gas industry. In fact, Hickenlooper has mastered the rhetoric of a concerned elected official, while at the same time working to help his billion-dollar oil-and-gas industry boosters cheat the rules that protect public health and water. While Hickenlooper has claimed he would increase fines and hold industry polluters accountable, behind closed doors he helped weaken and kill legislation aimed at doing just that. Case in point: the governor recently announced, with great pomp and circumstance, an initiative to make Colorado the “the healthiest state,” and created a safe drinking water week. Days later, and with far less fanfare, he successfully gutted legislation to hold oil-and-gas companies accountable when they pollute Colorado communities and water. That’s just the tip of the iceberg. In January, Hickenlooper’s oil-and-gas commission put forth water testing rules criticized as weakest in the nation, which included the Anadarko-Noble loophole, a huge carve-out for two of the biggest oil-and-gas operators in Colorado. The Anadarko-Noble loophole makes it easier for billion-dollar oil-and-gas companies to pollute water in northern Colorado, an area that’s home to some of the state’s most intense drilling and more than 25 percent of Colorado’s oil-and-gas wells. It’s also home to more than half of the most recent reported spills. Hickenlooper’s lobbyists also worked to weaken fines for oil-and-gas companies guilty of polluting. They did this, despite the fact that Colorado already has lowest-in-the-nation fines and a well-documented problem with spills and water contamination. In 2012, industry reported 402 spills in Colorado, 20 percent of which resulted in water contamination. Just six companies were responsible for more than 85 percent of all spills that contaminated water. Now, thanks to Hickenlooper’s efforts, these companies have even less incentive to stop polluting Colorado communities and water. Hickenlooper has also rejected funding to increase the number of state oil-and-gas well inspectors. His Department of Natural Resources agency joined with the oil-and-gas industry to oppose additional resources to increase the number of inspectors – from 16 to 24 – for the state’s more than 52,000 wells. The Hickenlooper administration also opposed reform efforts to increase transparency on the Colorado oil-and-gas commission. Oil-and-gas companies currently serve on the commission, which regulates their activities, posing serious concerns about conflicts of interest. Finally, the Hickenlooper administration worked to block a public health study to see if fracking is making Coloradoans sick. Hickenlooper’s chief of public health and the environment, Dr. Chris Urbina, testified against the need for the study – which was supported by local residents and medical professionals. Hickenlooper is, unfortunately, only one example of a state chief executive who seems to value his oil-and-gas donors over all others. New York’s Gov. Andrew Cuomo, Pennsylvania’s Gov. Tom Corbett and Utah’s Gov. Gary Herbert have all displayed similar tendencies. These elected officials need to be held accountable for their actions; they need to put the health and safety of their constituents ahead of the profits of the billion-dollar oil-and-gas industry. A stunning new analysis shows striking inefficiencies at work in Colorado that should infuriate anyone looking for a smarter approach to federal oil and gas leasing – including both conservationists and energy companies. In Colorado, leases sold by the Bureau of Land Management (BLM) have attracted nearly three times the number of costly, time-consuming lawsuits (known as protests) than we’ve seen in the rest of the Rockies. Our new analysis found that 76 percent of leases in Colorado were protested, as opposed to 27 percent in surrounding states, on average. 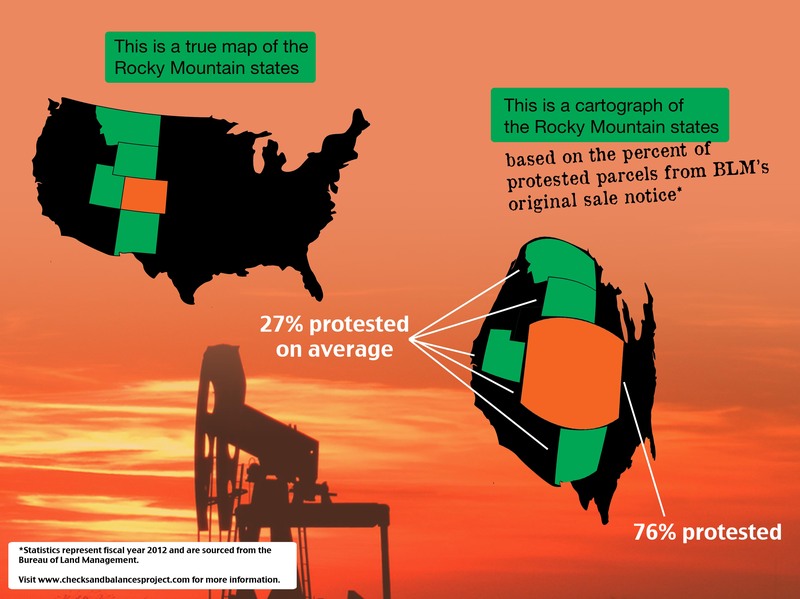 The analysis is based on BLM data recently released for the first time regarding the number of protests in each state filed by citizens and stakeholders on tracts of lands (known as parcels) available for oil and gas leasing. Protests are one of the key measurements for how controversial a particular decision to lease land for oil and gas development. Helen Hankins, the BLM’s top bureaucrat in Colorado, has failed to implement President Obama’s common-sense leasing reforms – designed to streamline the leasing process and reduce conflict dramatically by requiring research and analysis be completed prior to leasing. Those reforms called for a better balance between developing oil and gas resources and the protection of other public lands resources, including nearby parks and refuges, wildlife, and historic and archaeological sites. “There is no presumed preference for oil and gas development over other uses,” states the reform document. In other words, the reforms were meant to drive our local economies with a real balance between protecting public lands to support and attract high-wage businesses to the West, and using them to produce American-made energy – which together support 100,000s of jobs. In states like Utah and New Mexico – where the BLM offices are implementing the reforms – protests are down, and energy is being produced. That approach is working for industry and conservation interests – and most importantly our communities and our families. But in Colorado, Hankins has turned the President’s balanced reforms into a broken promise for our communities. Instead of helping oil and gas companies responsibly develop oil and gas resources in the right places, while protecting those lands that drive the economy and attract new business, Hankins continues to rely on decades-old plans and analyses – proposing to allow oil and gas drilling near places like Mesa Verde National Park, and Dinosaur National Monument. By miring all sides in expensive red tape, Hankins has failed Westerners who are doing everything they can to get back to work and support their families. They expect their government to champion the Western way of life, including use of public lands in a balanced way to support sustainable economic growth. The Obama administration must correct this failure by taking action to follow the directives in the 2010 leasing reforms now. The state ‘Communications Director’, one might assume, has the job as a public employee working on public lands issues and spending public monies, of informing the public and managing media relations. The ‘press’ and public are–this common-sense assumption goes–the PRIMARY purpose of his receiving a Federal salary as a taxpayer-funded public employee. But apparently not for BLM Colorado–where public information is no such thing, and the public and media are merely distractions from what ever other self-determined more important things, like defending illegal agency actions perhaps, or intentionally seeking to divide communities. This particular matter has its roots in the BLM Colorado State Office’s reckless oil and gas leasing policy that willfully ignores local communities, other federal agencies, state wildlife officials, local businesses and the public, to lease whatever public lands secret industry representatives nominate. This is despite Colorado having the oldest land use plans in the Mountain West, many dating back to the 1980s–like that that governs the public lands in the North Fork–most of which fail completely to properly account for, describe, consider or protect the resources and uses that exist or depend upon these lands today. Citizens for a Healthy Community–a Delta County based conservation group–partnered with the Western Environmental Law Center to file lawsuit seeking the names of the nominators who put forward the contentious leases in that valley. They won that suit. So, a Federal judge acknowledges that sharing information on public lands and public minerals is in the public interest and orders the public employees at a public agency to release that (public) information. And the senior staff at BLM Colorado Office responds, to paraphrase: Make us (again). Following the judge’s decision and the BLM Colorado’s clear loss in court, others–including the Durango Herald–have now sought identical information regarding contentious leases in their communities. Such as those surrounding Mesa Verde National Park opposed by the BLM’s own sister agency in the Department of Interior, the National Park Service. Now, the Colorado State Office of the BLM, our public employees spending our public monies to manage our public lands and minerals, is refusing to release that information. Again. Because, apparently its Communications Director has better things to do than communicate. Maybe like spending more time in court defending the indefensible, losing more lawsuits, and greasing the skids for oil and gas in violation of what the Federal courts have found to be in the public’s interest. Yesterday, Gov. Hickenlooper’s department of public health and environment (CDPHE) announced that they won’t levy fines against Williams Cos. for spilling 10,000 barrels of natural gas and toxic waste into Parachute Creek and the surrounding area in western Colorado. Earlier this month, the Governor lobbied to water-down legislation to toughen fines for oil and gas companies who pollute, despite Colorado’s well-documented problems of spills, and lowest in the nation fines. The Governor’s actions ultimately led to the death of the legislation. The Parachute spill, which occurred in the winter but wasn’t reported until the spring, has polluted water with cancer-causing benzene. In early May, benzene levels in the creek exceeded the federal safe drinking water standard. In their statement, CDPHE said that they aren’t fining Williams because the spill “was not due to negligence but to accidental equipment failure.” So now Gov. Hickenlooper’s department of public health and environment only “protect[s] and improve[s] the health of Colorado’s people and the quality of its environment” part of the time? We didn’t find that caveat in their mission statement. This isn’t the first time that the Hickenlooper Administration has failed to hold polluters accountable. A 2011 Suncor spill that polluted the South Platte River is still being cleaned up nearly two years later – and yet Suncor hasn’t been fined for dumping toxic levels of benzene into the river. Unfortunately, it appears that the Hickenlooper Administration is fine with oil and gas companies polluting our water and communities with waste and toxins – otherwise, why not hold them accountable for polluting by enforcing fines?